Engineers successfully attempted one of the most expensive wreck removal operations in history: raising an Italian cruise ship that capsized in 2012. Readers, this event has ended, but we thank you for your overwhelming engagement and comments throughout the Parbuckling Project. Here is a link to the official website where you can learn more: www.theparbucklingproject.com. Don't forget to follow @Reuters on Twitter for more live events and news. READER COMMENT: Great stuff, very good job by the "parbucklers", great coverage by Reuters. That sort of things should be covered like this one more often. It shows the complexity of certain jobs which otherwise would be unknown or trivialized by common media. Kudos to Reuters. After receiving the assignment to cover the Costa Concordia “parbuckling”, I had the idea to create a timelapse. Definitely not an original idea because in Giglio, there were more cameras shooting timelapses than there are island residents. A timelapse is a cinematographic technique used to shorten the action. It allows us to see very slow actions or natural events that we cannot see naturally using the technique of shooting pictures at regular intervals. Then we edit to create a video of about 24 or 25 frames per second. In this way you can see the action accelerate. READER COMMENT: The ship appears to be listing 1 or 2 degrees to port side. I hope that is on purpose. READER COMMENT: Great job everybody, I am Italian watching this event from abroad, feels good to see something going well in my country once in a while. The sounds of crew cheering over echoes of ocean waves on Giglio. A long project, almost a year of planning, has passed through the most dangerous stages. The crew of Parbuckling Project will continue to the next phases of the journey: stabilizing the cruise ship for further monitoring and investigation. READER COMMENT: Thanks so much Reuters for wonderful job today! I was riveted to the computer watching it, and fascinated with all the expertise, skill, and dedication! Again, Reuters you have done a marvelous service for us viewers! READER COMMENT: This has been simply amazing. I'm so glad to have been able to witness this. Thank you so much for the coverage and live stream. I've been checking it all day. What an incredible accomplishment! Latest update from the Parbuckling Project:: The ship has rotated approximately 25° with respect to the starting position. This means that the operation has gone beyond the point at which the vessel no longer needs to be pulled by the strand jacks and can now rotate under its own momentum and under the weight of the ballast water contained in the sponsons. wreck will be resting on the false bottom at a depth of about 30 meters. 11 towers with hydraulic mechanisms are in control of 205-kg (450 lb) cables under the Costa Concordia. They are attached to its side to slowly rotate the ship. The goal is to place it on six specially built platforms drilled into the granite rock bed. As the sunken side of the vessel inched out of the water of the course of the day, exposing the soiled underbelly of a ship the length of three soccer fields, a team of engineers who have been working on the project for most of the past year eased the pressure from the cables and prepared for a second phase. The second phase will occur when huge tanks fixed to the ship's exposed side begin filling with water, using the effect of gravity to pull the ship vertical. Oil booms surround the vessel to intercept waste water and oil trapped in the ship, but no significant environmental damage was observed in the first hours of the operation. Once the Concordia is upright, salvage teams will spend a months stabilizing it and preparing for it to be re-floated with the aid of additional giant buoyancy tanks before it is towed away for scrap. A reader has asked about recording video and posting to YouTube. Unfortunately, there are restrictions on doing so that state that recording video and re-posting violates the owner of the live video's intellectual property. We highly recommend you play it safe -- share videos on social media that don't violate intellectual property laws. 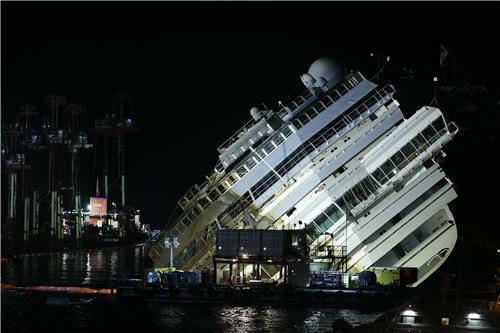 Costa Concordia has rotated more than 25º with 40º remaining until ship fully uprighted. Final 40º rotation should take 4 more hours. READER COMMENT: Reuters has given us an amazing window to view this entire operation. Very seamless, stable, accurate. By doing this, you have allowed us to be part of such a momentous situation - and to be as close as possible to the action. With great appreciation, I thank you. Timelapse video shows the wrecked Costa Concordia cruise ship as it inches off a rock shelf in the so-called ''parbuckling'' operation to right the ship that could continue into the early hours of the morning. Sarah Irwin reports. Looks like we are getting another update from the official engineering team shortly. Apologies in advance for the translation issues. Sometimes we have an English translator, sometimes we don't. Either way, we'll be able to get you a translation shortly. Una vez despegado de las rocas, el #Concordia ha rotado 10º. Las válvulas alcanzarán el nivel del mar en cuanto se consigan 20º. READER COMMENT: Do they have divers in the water just in case one of the two missing bodies should try to float away? This is just amazing and I'm praying for a successful outcome to this project. READER COMMENT: What a feat of engineering the whole operation has been so far. I hope all goes well for these guys. 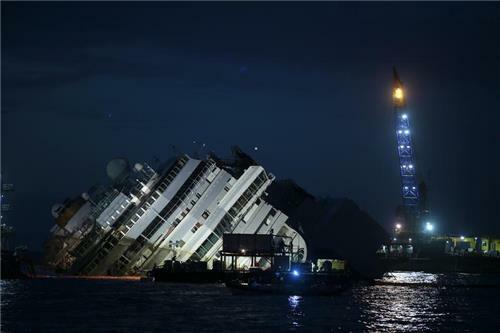 The most expensive wreck recovery ever is underway as salvage teams try to right and refloat the Costa Concordia. Paul Chapman reports. READER COMMENT: Only the Dutch can do such a complex job. Look at the Koersk in Russia. READER COMMENT: Watching from over here in the Gulf of Mexico. Amazing pictures of this historic salvage effort. Thanks for the feed! Good luck to all! Hoping that they are filming this in time lapse. Should be some incredible footage when they complete the operation. can the progress be measured by the water mark across the forward bulkhead? READER COMMENT: Most of the island's inhabitants can't wait getting rid of the ship, the salvage equipment and all the personnel involved in this operation and getting back to the "old time Giglio"
READER COMMENT: When the ship is finally in place how long will it remain off the island before it is moved? READER COMMENT: Where are these cables attached to on the other end ? READER COMMENT: The CP286, a so called SAR-vessel, is cruising around. In the background must be an Italian destroyer/frigate with a helicopter on the stern. READER COMMENT: They pulled it up this morning for few centimeter to get it of the rocks on stearboard. Now they have an estimated movement for 3m/hour. READER COMMENT: Does anyone know if the tide is coming in or out at Giglio? READER COMMENT: I think that when the ship turns back after failling of the cables. The people on the 'ASV Pioneer' are in very danger. Hope the hydraulic system will not fail. READER COMMENT: Any indication of how long the roll is supposed to take, once begin? The ground-breaking operation to bring the Costa Concordia cruise ship upright off the coast of Italy begins. Paul Chapman reports. READER COMMENT: Thanks for this live feed, it is much appreciated - watching from Cape Town,South Africa. READER COMMENT: Thanks Reuters. Watching from the Gold Coast, Australia. A long night ahead. Can we watch it via ipad? READER COMMENT: The project calls for dozens of crane-like pulleys flanking the ship to slowly start tilting the vessel upright at a rate of 3 meters (yards) per hour. READER COMMENT: Watching from Kabul, Afghanistan! Best of luck! The so-called "parbuckling" operation will see the ship rotated by a series of cranes and hydraulic machines, pulling the hulk from above and below and slowly twisting it upright. Once upright, the vessel will be stabilised before being towed away for scrap, probably next spring. READER COMMENT: Was it necessary to mention that the German Engineer was a woman? READER COMMENT: Incredible coverage. Amazing engineering comes from such a tragedy. READER COMMENT: I love it when a plan comes together. This is going to be interesting to watch. -Houston, TX.